OTTAWA - Like some political Moses, Jack Layton led his people out of the wilderness, only to die within sight of his own Promised Land. "Oftentimes, life's highs and lows are inextricably linked. That has certainly happened to me and, occasionally, the ups and downs were virtually simultaneous." In eight years as leader of the NDP he took his party to heady heights, but fell himself to a tragic disease at the age of 61. The end came with a terse announcement. 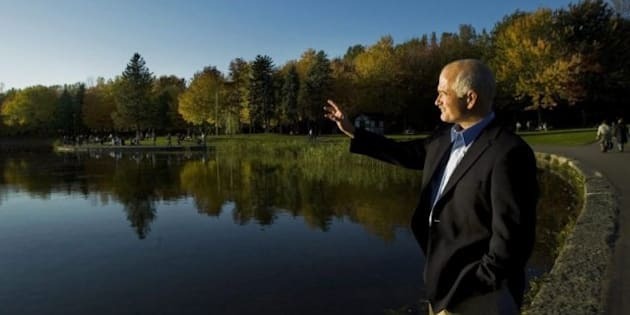 "We deeply regret to inform you that the honourable Jack Layton, leader of the New Democratic Party of Canada, passed away at 4:45 am today, Monday August 22," said the statement from his wife, Olivia Chow, and children, Sarah and Michael. Layton rebuilt his party, muted its internal squabbles, united its fractious factions and weaned it from old-style dogma to present a face more palatable to middle-class voters. He starred in the most successful election in the history of his party and won the title of Opposition Leader, which had eluded his more storied predecessors. Layton hobbled across the hustings last spring, leaning on a cane against the pain of a surgically repaired broken hip. He shrugged off the effects of treatment for prostate cancer. His dogged campaigning as Le Bon Jack won him a majority of the seats in Quebec, a cherished but illusory goal for New Democrats for decades. He slew the Bloc Quebecois and saw the long-dominant Liberal party reduced to a battered hulk. Layton was ready for a new Canadian political alignment that would pit left against right across the moribund Liberal middle. But the victory cup was dashed from his lips by the onslaught of another, more brutal cancer that wasted him to skin and bones — and killed him just 16 weeks after election day. Layton went, in one short summer, from triumph to tragedy and left behind less a political legacy than a political question: What if? He was a man who carried politics in his genes. A great-grandfather was a Father of Confederation. His grandfather, a Quebec provincial cabinet minister in a Union Nationale government. His father, a Tory cabinet minister under Brian Mulroney. He was a believer. He made that clear in the first sentences of "Speaking Out Louder:"
"Politics matters. Ideas matter. Democracy matters, because all of us need to be able to make a difference." Layton was born in Montreal on July 18, 1950. He grew up in Hudson, Que., an Anglo community complete with a celebrated yacht club. It was a small town, but hardly typical of small-town Quebec. He was a child of the placid Fifties in a well-off family in a well-to-do town. He was a teen and university student of the Sixties, with all that went with a decade that has claimed the word "turbulent" as its singular descriptive. Layton took his BA at Montreal's McGill University in the late 1960s, when radicalism blew through campuses like a stiff gale. The rebellious vigour of the times led him to political activism. He doffed the conservativism of his family and embraced socialism. "Events in the Sixties and Seventies were formative for me," he wrote in "Speaking Out Louder." "My path grew out of the tumultuous days of the October Crisis." He became an activist, canvasser and organizer for a community movement in Montreal as a student. By the time he earned his master's degree at Toronto's York University in 1972, his political genes had clearly activated. He had studied under Jim Laxer, a key figure in the Waffle movement that rocked the NDP at the time. Layton taught at Ryerson University in Toronto. But by the time he received his PhD in 1984, he had already largely abandoned academic theory for community activism and then the practicalities of municipal politics. "I was hooked on local politics and neighbourhood engagement," he wrote. First elected in 1982, he served on Toronto and Metropolitan Toronto councils for 20 years, honing his instincts and skills at the level of retail politics. He was a politician in the mould of a people's tribune, with rolled-up sleeves, 14-hour days and seven-day weeks. Every hand was there to be shaken, every story was there to be heard, every windmill was there to be charged. His politics were those of the poor, the homeless, the alienated, the disenfranchised. He served as vice-chair of Toronto Hydro, chair of the Toronto Board of Health and president of the Federation of Canadian Municipalities. He twice ran federally and lost. Layton's first marriage to high-school sweetheart Sally Halford, which had produced two children, ended in 1983. He would eventually team up with Olivia Chow, another municipal power-broker. Together they would become the go-to couple of the left in Toronto politics. They rode a tandem bicycle along the waterfront, entertained, led rallies, marched in parades, ran for office and won. Chow would follow Layton into the House of Commons in 2006. And she would be beside him in the dark summer of 2011. In his rise, Layton gained a reputation as a brash, aggressive, even abrasive figure. On a trip to Calgary for a meeting of the federation of municipalities, he raised local hackles with dismissive comments about the city, its appetite for new buildings at the cost of older properties and even its ritzy new city hall. There was an outcry in the local media and Art Eggleton, then mayor of Toronto, dispatched his own apology for Layton's comments. He also gained a reputation as a master of the political stunt and the over-the-top comment. Some joked that the most dangerous place to be around city hall was between Layton and a microphone, where one might get trampled. Rightly or wrongly, the image of a loud lout shouting into the mike from the left side of any issue clung to him after he won the NDP leadership in 2003. It was a leadership contest that pitted Layton and the trendy new left against Bill Blaikie and the traditional, Prairie populist wing. Blaikie was a United Church minister in the best traditions of NDP and CCF champions of old. Layton was an academic and a firebrand. Blaikie was a Manitoban, Layton was from Toronto, font of all evil for many Canadians, especially westerners. Layton won on the first ballot and went into renovation mode. He began to rebuild and re-brand his party. He was a people person whose BlackBerry kept him linked to hundreds of organizers, fund-raisers, recruiters and policy wonks. He worked through meals and vacations, pushing himself and his goals. He toned down the wild rhetoric, although he raised an uproar in the 2004 election campaign by accusing then-prime minister Paul Martin of responsibility for the deaths of homeless people because he failed to produce affordable housing. Despite that, Layton won his Toronto-Danforth seat in Parliament in 2004, an election that left Martin's Liberals with a minority government. The NDP raised its seat total to 19 from 13. It was a start. Layton criss-crossed the country to raise the party profile and in doing so, became the public face of the NDP. The trademark grin, the brush moustache, the earnest optimism, the trademark head tilt were the tools of his trade. The hellfire rhetoric cooled. This was reasonable Jack, optimistic Jack, the Jack of the kitchen table, not the street corner. The approach seemed to strike a chord with regular folk. In 2006, Layton's campaign produced 29 seats, but boosted its vote to 2.59 million. Momentum was building. In 2008, Layton campaigned not as a third-party leader, but as a prime minister-in-waiting. The vote total slipped slightly, but his campaign won 37 seats, just six short of its then all-time high under Ed Broadbent. By 2011, Layton was ready for a breakthrough. Despite the prostate cancer diagnosed in early 2010, despite the mysterious hip fracture, he was everywhere. In Quebec, his working-class French and his call to action on behalf of the ordinary family struck a note with voters grown weary of the Bloc and leery of the Liberals. On May 2, about 4.5 million people cast ballots for the NDP, giving the party 103 seats — 59 from Quebec — and making Layton leader of the Official Opposition. Just over two months later, looking pale and gaunt, he called a news conference to say he was suffering from another, unspecified cancer and he would temporarily step down as party leader. Nycole Turmel, rookie MP and veteran labour leader, took over in the interim. Deuteronomy 34 says God took Moses up to a high place and showed him the Promised Land in the distance. "I have caused thee to see it with thine eyes, but thou shalt not go over thither. So Moses the servant of the Lord died there in the land of Moab, according to the word of the Lord."